Come fall under the spell of San Miguel de Allende. Come walk her cobblestoned colonial streets, relax in her shade-dappled patios, sink into her slower pace, feel the warmth of her people. 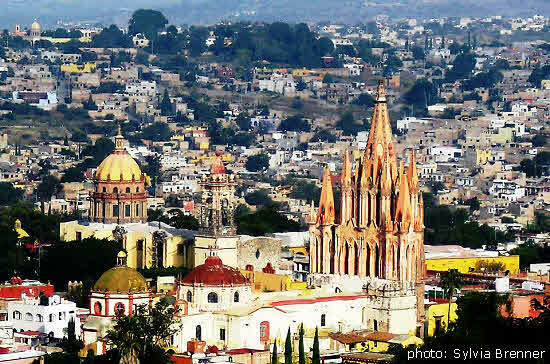 E veryone who's been there agrees: San Miguel de Allende is a magical place. A colonial jewel tucked into a bowl-shaped hollow in Mexico’s central highlands, its rumpled cobblestoned streets are lined with antique buildings painted as many colors as an over-made-up grande dame. Stucco walls drip flame-colored bougainvillea, pale blue plumago, lemony lantana flowers. Carved doors with brass knockers guard the entrances—and the secrets—of beguiling patios, tinkling fountains, lush gardens. But it takes time to convince San Miguel to reveal all her secrets. If you're like most visitors, you'll soon be asking: What’s behind those beautiful doors and mysterious walls? Are the people as colorful as their buildings? And how can we get a peek inside and experience the real San Miguel de Allende? That special insider’s look is a whole lot easier when you know a local who’s already broken the code and learned the secret route into the heart of this intriguing town... someone willing to take you by the hand and help you really experience San Miguel de Allende. Welcome inside my San Miguel. I first arrived in San Miguel de Allende in December, 1989. The bus bringing me from Mexico City turned onto the “caracol,” the peripheral road that curves above the town and offers a breath-catching view. As I looked down onto a town I had never seen before, I felt something stop inside me and I went very still. Then I turned to my traveling companion and spoke words I have never forgotten. “I don’t understand this,” I said, “but I’m home.” That feeling of rightness has never left me. To me, San Miguel is the essence of "home." And I love sharing that love and excitement with others. Whether you’re planning a short vacation to San Miguel de Allende, or a longer stay—maybe forever—this website’s for you. Here’s all the information you need to plan a perfect stay, rich in experiences you might have missed without our insider knowledge. Who else will lead you not only to the best hotels and restaurants but also tell you where to have a hand-embroidered "retablo" made in your very own likeness? Or steer you to the hole-in-the-wall spot where you can experience your own, unique "Mexican moment?" If you want to join the thousands of ex-pat Americans, Canadians and Europeans who call San Miguel home, we’ve got you covered too. We’ll point you to the best gym, Spanish class or carpenter, introduce you to real estate agents and artists, even tell you where to find the best prices on everything from furniture to pharmaceuticals. And who else knows—and tells you—where to order slip covers for the sofa your cat just shredded? We'll help you shave months or years off the learning curve of settling into your new community and country. San Miguel de Allende seduced me from the first day I arrived and it has never let go. Will you love San Miguel as much as I do? Come see. Experience San Miguel de Allende for yourself. One visit might be all it takes for you too. This website is a dynamic thing. It's constantly growing, evolving, and being updated as new information becomes available. Please come back often to see what's new. Or subscribe to SMAtterings, our newsletter, and you'll be the first to know. Inside San Miguel...The Blog keeps you up-to-date with additions and changes to experience-san-miguel-de-allende.com plus sends short news items about San Miguel de Allende. Subscribe here. San Miguel Shoes are the original "combat cocktail sandals" from San Miguel de Allende, Mexico. Designed for walking on cobblestones, they're comfortable, durable, stabilizing and pretty. You want to write. We're here to help you. Teaching craft and style, motivation and direction for your writing. It's what we do. And at Writers Workshop: San Miguel, we do it well. In the many cooking classes in San Miguel de Allende, you can learn to cook classic Mexican dishes and have fun doing it...and eating them!